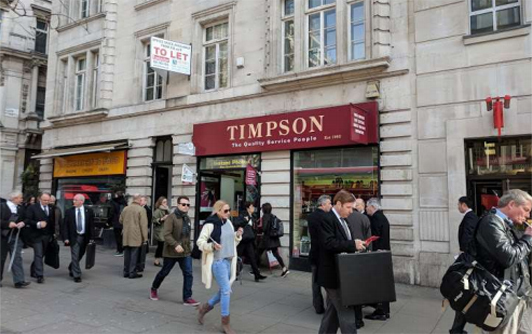 The unit is positioned on the High Holborn Station side of Kingsway just over 60 yards south of its Kingsway exit, next to the junction with Gate Street. 14 bus routes run along Kingsway with the nearest stop virtually in front of the unit. The unit has an area of approximately 340 sq ft with a frontage of approximately 20ft and a maximum depth of 21ft. Basement accommodation of approximately 361 sq ft is available, if required. A new lease is available with an upward only rent review at the 5th year, if appropriate. The lease to be granted outside the security of tenure provisions of the Landlord and Tenant Act 1954 (as amended). Adlers and Adlers Chartered Surveyors are the trading names of Adlers Surveyors LLP, conditions under which particulars are issued by Adlers Surveyors LLP for themselves, for any joint agents and for the vendors or lessors of this property whose agents they are, give notice that: (i) the particulars are set out as a general outline only for the guidance of intending purchasers or lessors and do not constitute, nor constitute part of, an offer or contract. (ii) All descriptions, dimensions, references to condition and necessary permission for use and occupation, and other details, are given in good faith and are believed correct but any intending purchasers or tenants should not rely on them as statements or representations of fact but satisfy themselves by inspection or otherwise as to the correctness of each of them. (iii) No person in the employment of Adlers Surveyors LLP or any joint agents has any authority to make or give any representation or warranty in relation to this property. (iv) Purchasers must satisfy themselves as to the compliance and safety of any plant, machinery r equipment. (v) All rentals and prices are quoted exclusive of VAT.